Great for gamers who can't get enough of PlayStation merch! Are you a gamer looking for gaming-themed apparel/footwear but find Nike’s PlayStation-themed PG2 sneakers a bit too hypebeast for your liking, then these flip-flops are just for you! 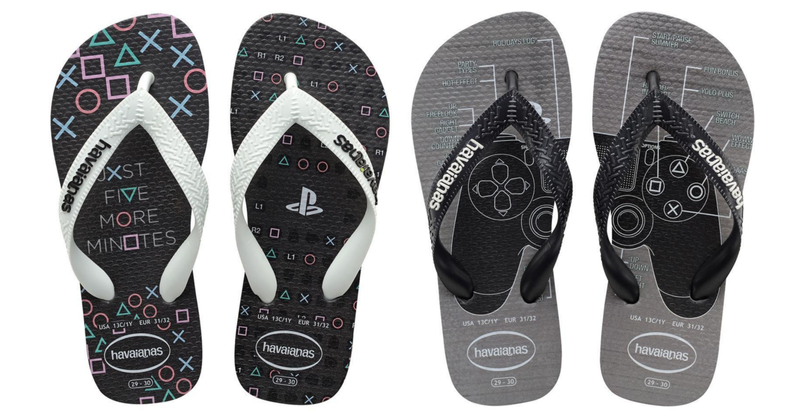 While not exactly new releases, Havaianas stores in the Philippines have these two awesome PlayStation-themed flip-flops in stock right now! The first pair features a primarily gray color with a black strap. The flip-flop pair also has a PlayStation-inspired print, specifically a DualShock 4 controller printed at its front. The other pair has a black color with a white stripe. Though unlike the first pair’s DualShock 4 print, this pair has PlayStation’s signature ‘triangle-circle-X-square‘ printed all over the front along with the PS logo and the phrase “Just Five More Minutes”. Interested in getting these flip-flops? Both are available now at Havianas stores in the PH for PHP 1,299. The pairs are also available at the Havianas PH website and at Zalora. Can’t get enough PS merch? PlayStation by iTech recently announced that it has a new batch of classic PS-themed merch on sale right now! Previous articleWoody, Buzz, and the rest of the crew are back in the first Toy Story 4 Trailer!